In 2014, one era of European space activity is drawing to a close, with a new era on the horizon. The future of the flagship Ariane launch vehicle is driving this transition; it is Europe’s single most critical space decision, upon which myriad developments hinge—from Europe’s share of the commercial launch market, to next-generation satellite designs, to multinational civil space collaboration activities. When the family-owned and operated Satellite Telecommunications Network (STN), based in Slovenia, celebrated their 10th year of successful business in the SATCOM industry, the occasion certainly did not pass quietly... the decade of service celebration included a gathering in a castle on an island as well as SatNews’ Publisher Silvano Payne, who was one of the invited guests. In July of this year, two of India’s DTH giants (Videocon d2h, and TataSky) promised they’d be adding 4K/Ultra HDTV services sooner, rather than later. Videod2h talked about such services being added later this year, while TataSky already has a huge set-top box (STB) order in place with Technicolor for delivery to them early in 2015. The European DTH market may be poised for a significant shakeup in the coming months, following a proposed merger between three of the continent’s largest DTH platforms: British Sky Broadcasting (BSkyB), Sky Deutschland, and Sky Italia. The High Throughput Satellite (HTS) market is expanding, particularly with plans to launch Ka-band satellite services well into 2016. Ka-band frequencies have much narrower beamwidths than other popular bands, such as Ku-band. Companies today must re-assess their talent needs in order to ensure they remain competitive and drive growth. 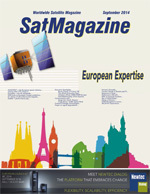 The opportunity to discuss trends on the ground, from service quality to signal assurance, was recently afforded SatMagazine with the president of Kratos Integral Systems Europe, Mr. Bruno Dupas. In the 1890s, electric power was seen as the coming technology, expected by many to be a replacement for the steam engine as a source of motive power. Mary Cotton, the CEO of iDirect, possesses more than 25 years of technology leadership, creating and driving growth in her previous roles as a Chief Executive Officer (CEO), Chief Operating Officer (COO) and as a Chief Financial Officer (CFO) in various organizations. Ka-band satellite systems are proliferating around the world, offering new bandwidth and business opportunities for commercializing the 20/30GHz frequency bands. However, as Earth stations expand beyond their traditional C- and Ku-band “comfort zone” into new Ka-band services, their designers and builders face challenges. The success of Norsat International’s satellite division started out when the company designed a custom small form factor satellite terminal for an offshore government in 2002. Norsat built upon the success of that delivery and founded the Satellite Division in 2004, where the portable terminals started selling into various militaries worldwide. These terminals were designed in consultation with the customer to achieve higher performance in a smaller form factor than was available on the market at the time. The broadcasting industry continues to experience massive growth across the globe... the industry is now migrating from Ku-band to Ka-band in order to improve global news gathering capabilities. Craig Simon is the President and CEO of FedEx SupplyChain, an integrated logistics provider that serves as a vital piece of the overall FedEx enterprise operation. SatBroadcasting™: The Current Trends + Prospects For PayTV Versus FTA In Russia, The number of payTV users in the Q2 2014 increased from 500 thousand to 3.5 million users. The Russian payTV market steadily grew in 2013 at a faster rate as compared to the rest of the world, by attaining a 16 percent expansion rate. Serge Van Herck, the CEO of Newtec, talked to SatMagazine about his vision, what potential dangers lay ahead and how Newtec is keeping their competitive edge to meet the growing demands of their customers. Approaching the IBC Show and the last quarter of 2014, Spacecom, the operator of the AMOS satellite fleet, has made the AMOS brand a well known name across the globe. Monitoring & Control Systems (M&C) and Network Management Systems (NMS) have always been important sub-systems of satellite ground stations and VSAT networks. However, we see a new trend wherein the importance of that sub-system for the operators and service providers has increased significantly. This demands implementation of new technologies. This article will present some highlights of these new trends and technologies. Mr. Allred is responsible for growing ORBCOMM’s business across international markets and managing the company’s regulatory and licensing efforts. Under his guidance, ORBCOMM has received approvals to expand into 39 new countries and territories. Mr. Allred has also led an effort to consolidate ownership of key regional Gateway Earth Stations and to expand to new sites around the globe. Available for airlines in 2015 will be GX Aviation. This will be the first—and only—Ka-band network that will provide consistent coverage, delivering 50Mbps to aircraft, everywhere in the world. In the past, it was quite simple—satellites transmitted one analog program per downlink channel. However, all that changed in the early 1990s, with the advent of digital transmission systems and modulation methods which allowed data rates high enough to incorporate multiple programs per channel. Still, moderate-sized antennas worked well enough for the new digital signals that little change was required at existing Earth stations. Satellite communications have come a long way since Sputnik 1, the world’s first communication satellite, which was launched into orbit by the Soviet Union on October 4, 1957. Fast forward more than half a decade and now, making phone calls, sharing documents and emails as well as accessing a network from anywhere in the world has become the reality. Indeed, some would even say rather commonplace. However, what’s next? The widespread revision and restructuring of satellite infrastructure taking place in the audio market today is due to a number of causes; the most important being the need to replace the outdated 1gen of satellite receivers, and the new palette of possibilities offered to audio broadcasters by audio over IP. Global Real-Time Tracking + Monitoring For Aircraft, By Jean-Louis Larmor, Vice President, Corporate Development, STAR Navigation Systems Group, Ltd.
Over the first part of 2014, the news has been focusing on several tragic aerospace accidents and on the necessity to efficiently track aircraft fleets around the world. Mr. Makhnovskiy has been with Orion Express since 2011. He graduated from the Moscow Technical University of Communications and Informatics, where his area of study was in network and switching systems. Event—IBC2014’s Industry Importance, To determine where you will be in 2020, IBC2014 in Amsterdam will help you uncover your future. Over the years the IBC Awards has become one of the centerpieces of the entire show: a fast-paced, vibrant, and free-to-attend celebration of the best that the global industry has to offer that acknowledges excellence in a number of key fields. This event is more than simply an awards show—many times, the crowd in the 1,700 seater RAI Auditorium will delight at the exclusive glimpses of cutting-edge content.